Xamarin is a Microsoft owned platform, that allows developers, using a C#-shared codebase, to write native Android, iOS (and even Windows and MacOS) apps with native user interfaces and share code. This means you can create an application once, and deploy it to both Android and iOS, both which run natively on the platform. One codebase, two platforms. This course is packed with real-world examples, exercises and best practices. 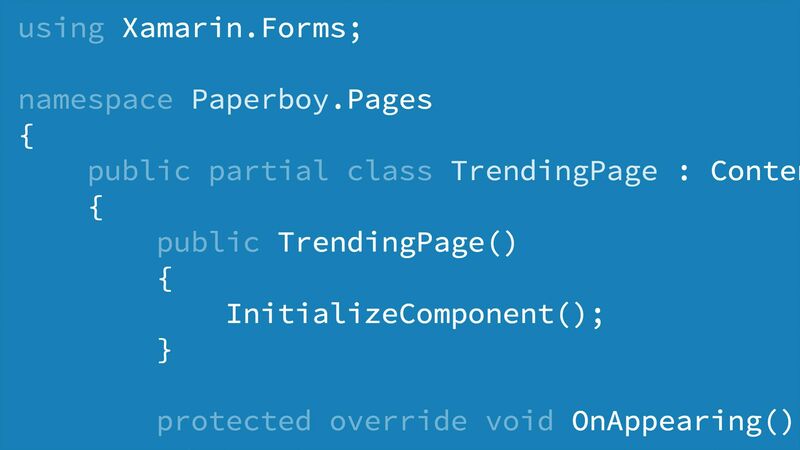 Not only will you learn how to use Xamarin Forms, you’ll also learn first-class tips to make your code cleaner and more maintainable. Lectures also have downloadable source code so you can code-along while watching the videos. 2. The Complete Xamarin Developer Course: iOS And Android! With this course, you will be able to create native Android and iOS apps that share up to 100% code, apply for junior mobile development positions (Android and iOS), increased career options as a Multiplatform developer, and build windows desktop, windows store, Mac, and even smart watch apps that share the logic of your iOS and android app. Along the way, you will learn how to leverage native functionality and even native Java and Objective-C code in your Xamarin forms apps. You'll find out how to continuously deploy new versions of your app to your users and learn how to use version control for better deployment to other developers, testers, and the App Stores. Embed videos in xamarin forms and your application. The main focus of this course is only on the Xamarin Forms with some real world application. In this course you will learn the how to create the the complex kinda application with real time implementation in Xamarin Forms . You will learn the Xamarin Forms with the challenging exercises. You'll also learn the the integration with restful web services. Also one interesting thing for the Xamarin forms developer is included in this course, that is embedded videos. So you can also embed the videos of your choice in xamarin forms. The complete fundamentals of MVVM like data binding , commanding etc. Creating quotes application without MVVM. Creating quotes application with MVVM. Implementing dependency injection inside xamarin forms application via unity IOC container. Creating quotes application with MVVM prism. Implementing MVVM prism inside xamarin forms applications. Implementing dependency injection and IOC principle along with MVVM prism. Implementing prism delegate command, prism navigation and listview selection. Build an azure mobile app inside the visual studio. Implement GET , POST , PATCH , DELETE in Azure Mobile App. Deploy azure mobile app to microsoft azure portal. Integrate azure SDK in xamarin forms. Make asynchronous API calls, store and retrieve data from the cloud, and use the JSON format for server communication. This courses teaches you how to code using xamarin forms and build beautiful android and iOS apps by using xamarin forms and azure mobile app service. In this course you will go through development of a complete iOS and Android native application using Visual Studio (or Xamarin Studio), C Sharp and Firebase. This course covers a wide range of topics such as interface design, databases and data structures as well as user authentication through Firebase. This course is about getting clear understanding of XAML used in xamarin forms, gaining good knowledge of XAML and design UI for Page First Development approach is really important. Although this course do not focus on page first development but give best possible start to understand how important it is to understand XAML to create best xamarin forms apps. Create useful unit tests and integration tests for your Xamarin backend code (UI independent). This course contains automated tests. With automated tests you can test functionalities after every bigger code change or before a release. You can run these tests automatically in the background so you don’t waste so much time on manual testing. In this course you will get to write tests for your shared code. At first you will create unit tests where you will test single functionalities of an example app. In the integration test section you will involve other components in your tests like the database.